• Time to take action against congenital rubella? 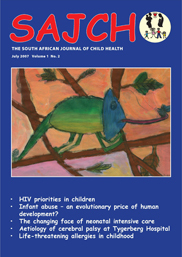 • Reducing neonatal deaths in South Africa – are we there yet? 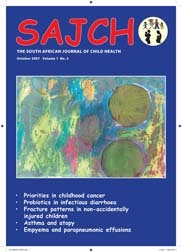 • Should routine diarrhoea management be modifiedwhen the prevalence of paediatric HIV infection is high? What does national health insurance offer children? Can thymic size predict survival in preterm infants with severe RDS? 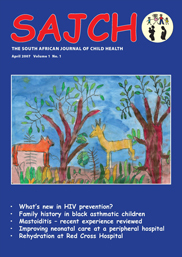 HIV-related oral candidiasi - a marker of HIV disease progression? Cleft lip and palate - what do new parents want to know? Idiopathic thrombocytopenic purpura - do we need guidelines? Infant abuse - an evolutionary price of human development? 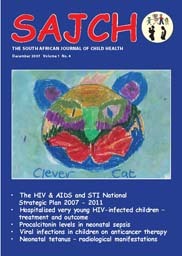 What's new in HIV prevention?